Theprobiotics, after years,have gone on to have the importance they deserve in food.They were only taken into account by naturists but fortunately can find anywhere and are accepted “socially” by most people and incorporated into your diet. Digestive problems increasingly affect,causing discomfort and problems that must be assumed in everyday life and take into account without recourse to the doctor. Probiotics are live, beneficial bacteria that are present in our digestive system.They are very important in maintaining digestive health and general welfare of the body. Some medications such as antibiotics or excessive sugar intake just with our natural probiotic gut flora.Thus, what happens is that there are more bad than good bacteria.The balance of flora resulting in disorders such as allergies, skin problems, urinary tract infections and even mood swings is lost. 70% of the immune system is located within the digestive system.It is therefore essential to keep it balanced and healthy, and therefore “good mood”. The problem is the variety of brands and probiotic products on the market today and that makes it much more difficult to know which are of higher quality.The best quality often become quite expensive. The kombucha is made by fermenting sweet tea with a specific mix of bacteria and yeasts.The result of this fermentation is a carbonated beverage containing vitamins, acids, enzymes and of course, very healthy probiotics. The health benefits of kombucha include a reduction in joint pain, more energy overall, better digestion and good support to the immune system in general. Another feature of this carbonated beverage is slightly sweet and serves as a substitute for soft drinks or juices industry which generally have more sugar than is desirable and also destroy our intestinal flora. Kimchi, or fermented cabbage(sauerkraut-like) has been the basis of the typical Korean diet for centuries.The West is discovering now, rather than their exotic flavor, for itsnumerous beneficial properties. Kimchi is simply chopped white cabbage or fermented cabbage and some spices in a very similar to the preparation of kombucha process, so that their properties and benefits are similar to those of this drink. Miso is another probiotic foods par excellence.It is a Japanese paste made ​​from fermented soya beans (sometimes with rice and / or barley).In the West it is known more for being the essential component of the famous Miso soup.But this pasta has numerous health benefits. It helps regulate our intestinal transit and reduces the risk of heart attack or cancer.Additional benefits include less fatigue, reduced cholesterol levels, lower blood pressure and inflammation. It is perhaps one of the best known probiotics for all.Is time consuming among all populations and from ancient times it is known that yogurt rebalances the intestinal flora. The result is a smooth and creamy, full of beneficial bacteria product to our health.Traditionally recommended intake of yogurt to those who are taking antibiotics or suffering from a yeast infection. Something to keep in mind about these probiotics is that not all yogurts are produced in the same manner.Heavily loaded with sugar yogurts,the same benefits are not obtained with a natural yogurt.What’s more, yogurts too elaborate may adversely affect our digestive tract for that very high sugar content. Kefir is one of themajor probiotics.It is a fermented milk product;basically a liquid and a slightly acid flavor yogurt and therefore drinkable. It is packed with nutrients such as probiotics,vitamin B12, calcium, phosphate, magnesium,among others, and may even cure problems of our digestive tract.Combat inflammation and improves digestion. 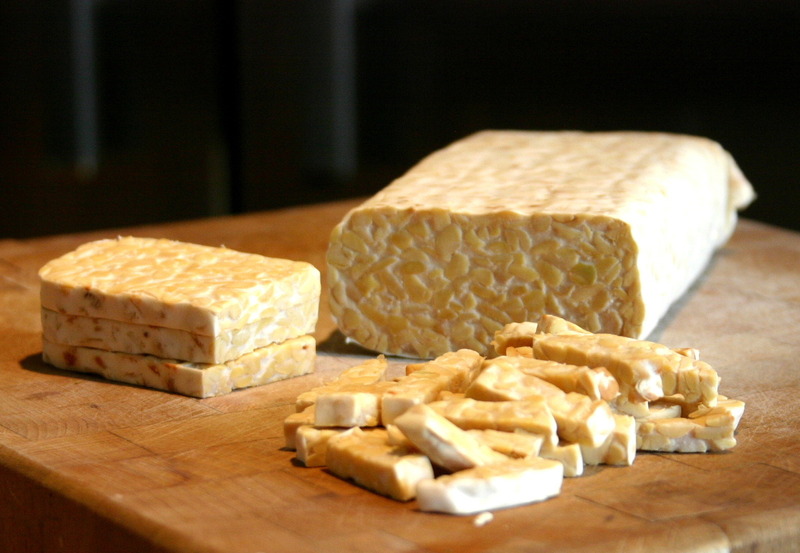 Originally from Indonesia, tempeh is made​​from soybeans,which adopt a consistency similar to a cake whose mass is held together by a fungus that occurs during the fermentation process. Tempeh is a popular substitute for meat among vegetarians as it is loaded with protein, vitamins and minerals.Another aspect that favors huge popularity is its versatility:it can be applied to many recipes of traditional considered. The sourdough bread is packed with carbohydrates.Traditionally it was treated as a bread of poor quality but the sourdough bacteria are probiotic.It is also one of the tastiest breads in the world. This sourdough is made ​​from a yeast dough and with bacteria called“lactobacillus”.With this, all the ingredients of bread are fermented but it’s better than beneficial bacteria and probiotics to the digestive system are provided while enjoying a tasty bread.